Villa AA EB1 is a 2 floor condo set directly on Gibbs Beach. It is one of only 6 condos in the complex which has a shared pool just steps from the villa. I could see 3 couples sharing this villa and enjoying meals in the gazebo prepared by the private cook. The price is a great deal especially when you consider that you are on one of the best beaches and have a pool! 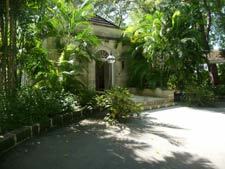 Villa RL HER is an elegant villa with beach frontage right on the Sandy Lane beach. This villa is for the guest who is looking for a grand estate with everything at their fingertips. This villa also has a large pool, a private tennis court, and is built of coralstone in an elegant but comfortable manner. Villa BS WHV is a recently renovated 4-bedroom villa on Gibbs Beach that would be great for families. It is right on the beach and has a very nice pool. The décor is fresh and bright and there are great gathering places like the beachside veranda for family dinners. One of the unique luxuries when staying at a Barbados villa is that you are pampered by a full-time staff that typically consists of a maid/laundress and a cook. Many of the larger villas also have additional staff which can include a butler who will help you coordinate your activities. For some people the idea of staff may seem foreign, I know it did for me. I wondered how comfortable we would feel with a staff in the villa. Any fear I had was totally unwarranted, because the ladies and gentlemen that work at the villas are very professional and experienced. They know how to get their work done and make your stay more pleasurable in the most discreet and friendly manner. We quickly adapted to this new way of living with our clothes freshly cleaned and pressed each day, and lovingly prepared meals served as the days schedule required. Each villa cook will have their own style, but many of them can and will cook any type of food you desire. We had some wonderful meals including our arrival dinner of fried flying fish, a blueberry apple pie for lunch one day that I will NEVER forget, and chicken and rice dinners that were cooked with the most delicious spices. Dining in at the villa is not only convenient and delicious; it's a great way to save money as well because the staff is included in your rental package, so all you are paying for is the food which we found to be very reasonable. One of my favorite things about Barbados is how varied the activities are there. If you are there purely for relaxation and privacy then you will love being tucked away in your villa estate with a staff to take care of the details. For those who are looking for activity; the west coast beaches are great for sunning, snorkeling and boating. You can also spend a day driving along the quieter and rugged east coast where surfers like to play. We spent an afternoon exploring the east coast and I loved the contrast from the west. The waves were bigger and the coast rocky and extremely picturesque. We passed a few dozen hikers that were headed out for a mountain hike, and saw some teens surfing the Soup Bowl. Getting around the island by car is pretty easy as the roads are well taken care of and there are signs, although we also recommend a co-pilot who can be following the map. As we drove around we saw a lot of great sites that I would like to go back and visit like the botanical and wildlife preserves, The St Nicholas Abbey, and the Mount Gay rum factory. 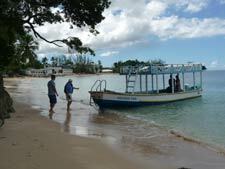 One activity that we did treat ourselves to was a glass bottom boat tour and snorkeling. I highly recommend it! It was reasonable priced at $35 and was a 2 hour ride along the coastline with 2 snorkeling stops where we swam with turtles, floated over gorgeous coral full of tropical fish, and snorkeled over an old ship wreck.